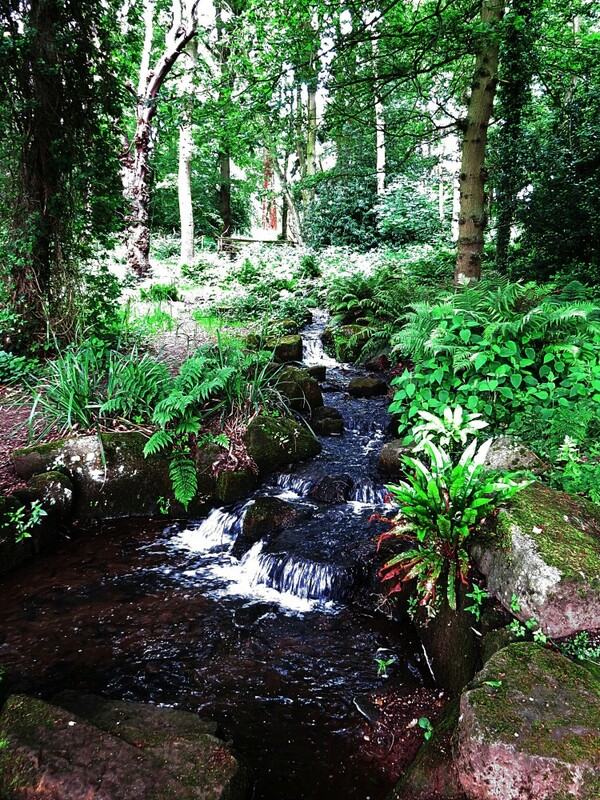 The Trentham Estate – The Good Developer? Wearing one of my other hats, I serve on the committee of an amenity society for one of the inner London boroughs. Our job is to vet planning applications and pass on that advice to the planning officers and planning committee. Over the last few years we have seen a huge surge in inappropriate overdevelopment, where little is being given back to the community. The large developers have deep pockets, able to employ top experts experienced in circumventing planning legislation and top QCs to fight the applications at Appeal. It is as if in this unequal contest the planners have one hand tied behind their backs. Like many Londoners I have watched with dismay this charade played out time and time again, and it is easy to believe that there is no such thing as a good developer. But my visits to the Trentham Estate near Stoke on Trent make me wonder if I might have found one. St. Modwen, who bought Trentham in 1996 acquire almost exclusively brown field sites and state that they ‘look beyond standard development routes to create innovative schemes’. Their other core values include sustainability, local employment, social inclusion and community engagement. So how does St. Modwen, or rather its subsidiary company, Trentham Leisure Ltd measure up to these ideals? Creating a shopping street of 50 log cabins and 14 restaurants serviced by acres of car parks sounds like typical developer desecration but on my weekend visit in August it was a surprisingly pleasant experience with unusual shops and good outdoor places to eat, albeit a long walk from the car. There was the underlying sense that everything was being well managed. The entrance to the estate is in the middle of the shopping village over a small modern suspension bridge, and to the right lies the gardens and the site of the house, to the left the diminutive remains of a Capability Brown landscape with its large lake, and straight ahead grassy slopes used for picnics, tribute band concerts, festivals and outdoor theatre. Formerly one of the residences of the Dukes of Sutherland, Trentham Hall was demolished in 1911 and the estate and gardens run as a pleasure park by the Sutherland family until 1978. After this, the estate fell into serious decline and disrepair, changing hands several times until St. Modwen acquired it from British Coal. Trentham Hall was rebuilt in the !840s by Charles Barry (more famously known for designing the Gothic Revival Houses of Parliament). However his country house style was Italianate and at Trentham he designed a palazzo with a vast formal parterre. Interestingly on the back of the commission for Trentham, the Sutherlands asked him just a few years later to build another very grand Italianate house with stupendous parterre at Cliveden. 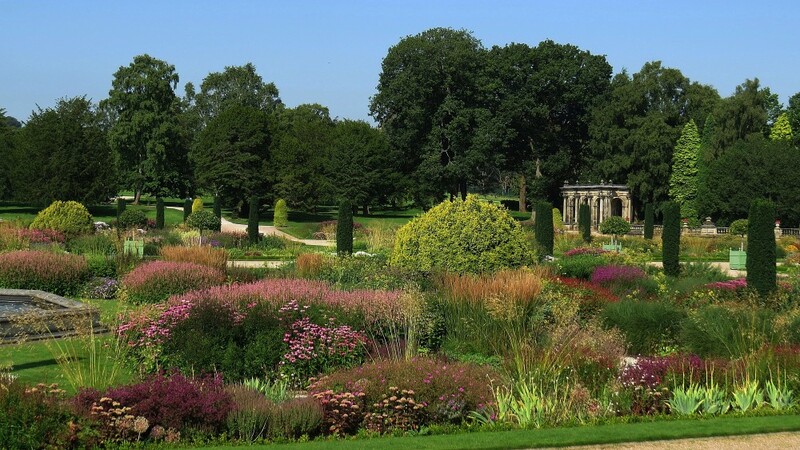 Trentham’s parterre could easily have been grassed over as part of St. Modwen’s restoration but instead they commissioned contemporary garden designer Tom Stuart Smith to design a parterre with an informal layout of perennials and large plantings of grasses. This was a remarkably bold and innovative decision. The large size of the planting beds and the height of many of the perennials and grasses tend to obscure the formal layout and I found the tension this created to be uncomfortable. As a parterre it seemed a contradiction in terms, formal yet its formality obscured. Barry’s parterre would have been seasonally bedded out and overviewed from the state rooms of Trentham Hall, and interestingly when the Stuart Smith parterre is photographed high angle shots are almost always used. 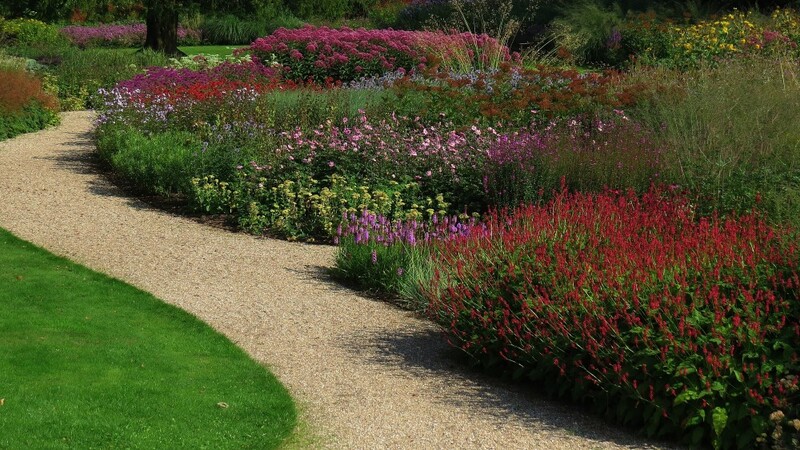 For me the adjoining garden by Dutch landscape designer Piet Oudolf held more interest. 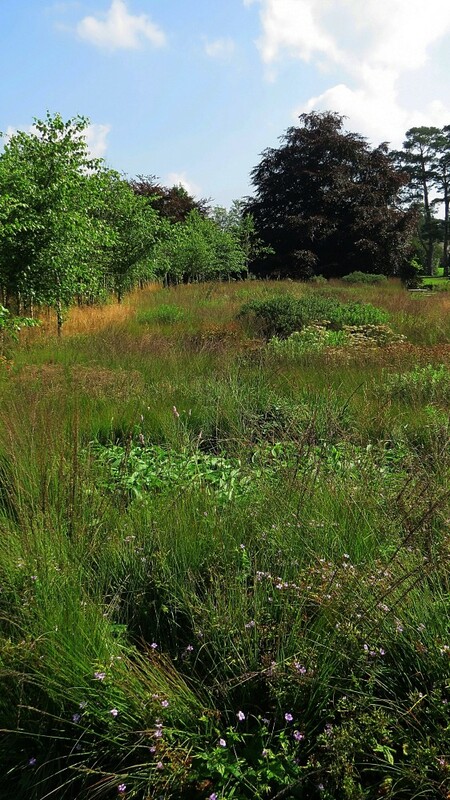 St. Modwen commissioned Piet Oudolf, to design two completely new gardens at Trentham, the Floral Labyrinth and the River of Grass. 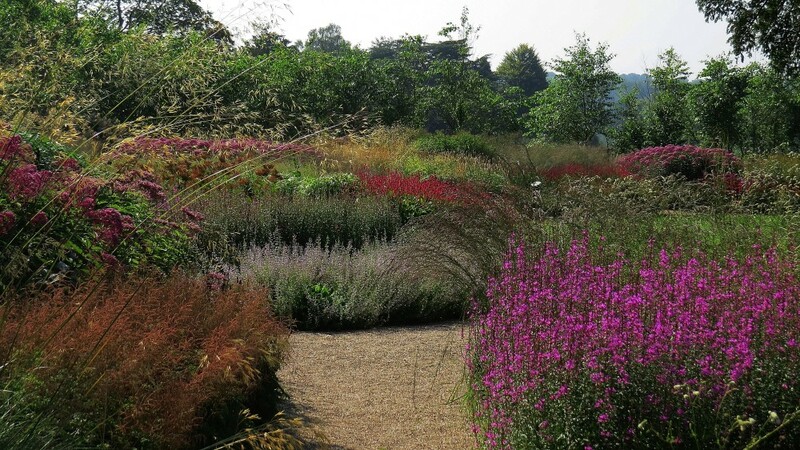 The Floral Labyrinth is in Oudolf’s signature prairie style with drifts of perennials and grasses in fairly narrow beds viewed from informal winding paths. The variety in leaf, texture, flower and height could be viewed closely and I found the garden more engaging than the Stuart Smith parterre. 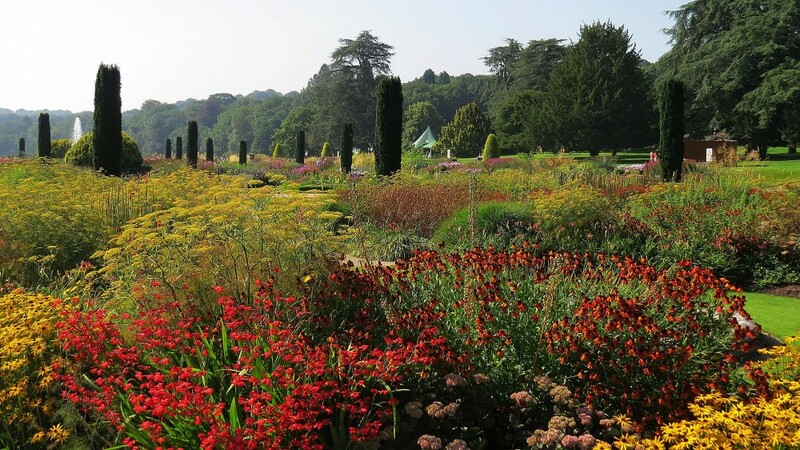 This style of planting looks impressive in summer, a time when the gardens at Trentham are most used. The River of Grass is sited on the damp flood plain of the River Trent and is best known for its spring interest. On completion in 2005, the gardens were seductively photographed by our best garden photographers, applauded in all the garden magazines and were recipients of numerous awards. The media attention that these new and innovative gardens received provided a huge boost for Trentham’s commercial success and popularity. St. Modwen had deservedly pulled off a great marketing coup whilst at the same time creating something unique and enduring. 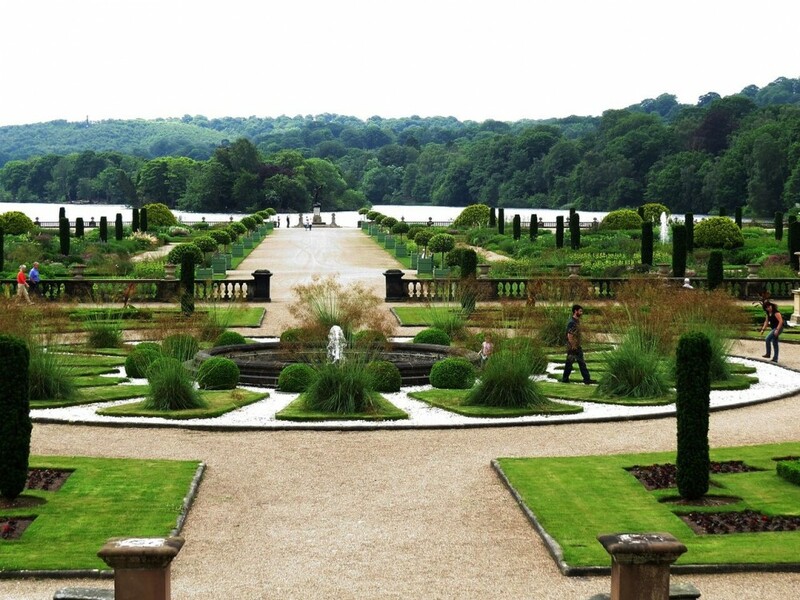 There have been subsequent initiatives at the Trentham Estate, the current one being to restore the Capability Brown landscape. This is intended to be part of the national celebrations for the tercentenary of his birth in 2016. Records are very sketchy, but we know from accounts submitted that Brown worked at Trentham from the early 1760s through to the 1770s. It was at this time that the spectacular lake was built, hugging the contours of the tree-covered hills on the west bank. Enough space was left for serpentine walks opening to lake vistas and it is this that the Capability Brown Restoration Project at Trentham intends to restore together with the introduction of sheep grazing land. As a Capability Brown fan this is for me an exciting undertaking that will, without doubt, bring St.Modwen further positive media coverage. Trentham is a happy marriage of successful commercial interests whilst at the same time providing substantial innovative assets for the community. However the real test for this canny developer will come with their proposals for the huge redevelopment project at New Covent Garden Market in London. Let’s hope I’m not mistaken, and St. Modwen’s core values hold true.